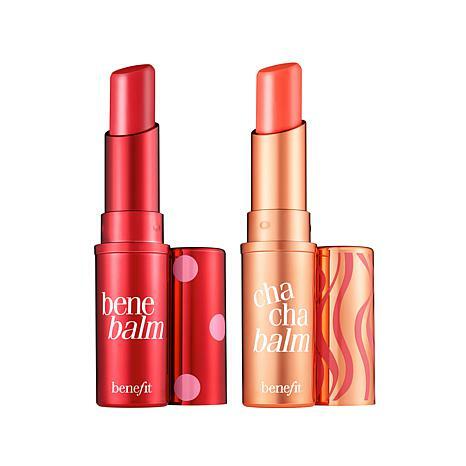 These tinted lip balm formulas help condition and hydrate your lips. Each offers your lips a subtle, soft kiss of color — the perfect amount for a drama-free day. Ingredients: Jojoba Esters, Diisostearyl Malate, Polyglyceryl-2 Triisostearate, Dimer Dilinoleyl Dimer Dilinoleate, Synthetic Beeswax, Mangifera Indica (Mango) Seed Butter, Ozokerite, C20-40 Alcohols, Polyethylene, Trimethylolpropane Triisostearate, Parfum (Fragrance), Ethylhexyl Palmitate, Aluminum Hydroxide, Dipalmitoyl Hydroxyproline, BHT, Geraniol, Citronellol, Linalool, Luffa Cylindrica Seed Oil, Hexyl Cinnamal, Tocopherol, Benzyl Salicylate, Trihydroxystearin, Propyl Gallate, Butylene Glycol, Caprylyl Glycol, Phenoxyethanol, Sodium Hyaluronate, Hexylene Glycol. [+/-: CI 12085 (Red 36, Red 36 Lake), CI 15850 (Red 6, Red 7, Red 7 Lake), CI 15985 (Yellow 6, Yellow 6 Lake), CI 19140 (Yellow 5, Yellow 5 Lake), CI 42090 (Blue 1 Lake), CI 45380 (Red 21, Red 21 Lake, Red 22 Lake), CI 45410 (Red 27, Red 27 Lake, Red 28 Lake), CI 73360 (Red 30, Red 30 Lake), CI 77891 (Titanium Dioxide), CI 77163 (Bismuth Oxychloride), CI 77491, CI 77492, CI 77499 (Iron Oxides), CI 77742 (Manganese Violet)]. 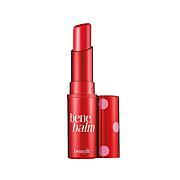 Love anything that starts with Bene and ends with balm. Pout is my favorite. Softens without being gooey or tacky and offers a light color to the lips. Tube lasts a long time. Dollars well spent, in my opinion. I keep one in my purse and one in my gym bag. Splash of color is a nice touch. Works well. Looks good. Nice and big. VERY moisturizing & slippery. Unlike Lancome Juicy Tubes, NOT STICKY at all.Virtually zero-to-barely-existent hint of color on Lt.cauc.skin. Exactly like chapstick etc.,but actual usable product seems roughly 2X the size. I have the lolli-, posie-, bene- & chacha- balms AND corresponding tints. 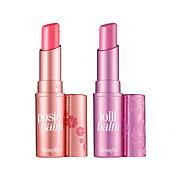 Bene- has the most color (red), followed by lolli (lavender-lilac) & chacha (coral peach); posie is a girly candy pink best for tweens. My fave is Lolli in the spring; chacha in summer & bene in winter. My second set of these two (Benebalm & Cha Cha). They really smooth out other lipsticks which is how I use them. CC has little color but still is soothing and Benebalm is soft red tint. They are my favorite lip balms.!! Great stocking stuffers..thinking ahead already. If you want a lot of color buy a regular lipstick. I love my Benefit lip balms. Colors are great for any skin tone. They are not sticky or goopy feeling. They give a nice hint of color for a more natural look. 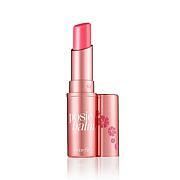 I keep one in my purse for times when I don't want to wear lipstick but want a sheer color.